Don't believe it, that's the Spirit! I regularly talk to groups, Women's Institutes, Senior Citizen groups and the like. It's a challenge in a way and keeps my brain in reasonable shape. My bread and butter talk, so to speak is entitled 'There's Nowt so Strange as Folk', based loosely around a book of short stories I wrote a year or two ago. It can't be all bad because on occasion I have been asked back. no mean feat. The last time I spoke I was greeted with the words, 'Pleased to meet you, I hope you are better than the one we had last week, she were terrible.' Not exactly designed to inspire confidence but not as bad as another speaker I know of. Five minutes into his spiel on the workings of computers some old lady stood up and spoke immortal words. 'We don't want this rubbish.' (Evidently the group had been expecting to be taught the basics of how to use a computer, not how the computer's innards function.) They don't mess about, pensioners groups, straight to the point and if they don't like you be prepared to run. 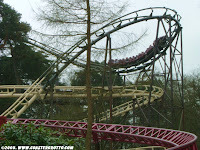 The reason f or this particular blog being the news that Alton Towers is dismantling a twenty eight year old, seventy five feet high rollercoaster. Interesting but made even more so when one considers what the dismantlers have found to date. Fifty three odd shoes, an irritating loss but not unexpected, but then it really gets interesting.Ten pairs of underwear. I must be careful what I say here but the mind boggles. I daren't eve n guess but perhaps its best to leave it to the readers own imaginations! One final discovery, surely the strangest of them all being one prosthetic leg. I hope it was not the same man who lost the ear, For there would be an unfortunate double whammy. (Why am I assuming it was a man?) Imagine the problems this mishap would cause you, stuck at Alton Towers minus a leg. Its not funny really but if you didn't laugh you would probably cry. All the old jokes immediately spring to mind. You'd really need a leg up and then what do you do, hop down to the information desk? Do they have a set, practiced procedure for lost legs? Surely they don't have spares for such an emergency? 'No problem, sir, left or right?' You could sue them but you wouldn't have a leg to stand on. It would not exactly enhance your day and I've no doubt you wouldn't get a replacement on the NHS the next day. All in all a right bloody nuisance but what a story to tell at your next cocktail party when the conversation flags, the day you were legless at Alton Towers. The Mail on Sunday gave away a free interactive Pub Quiz CD this week. Not the world's most intellectual offering but what does one expect from the Mail. That said there has been interest in quizzes for as long as I can remember and the Mail reflects this fact. The quiz itself, though no doubt harmless, is cringingly banal at times, no doubt reflecting the Mail readership or perhaps even the British psyche. 'Please choose your teams name.' Choice includes the Mushy Peas, the Bitter Shandies and the Pork Scratchings. Does that really reflect pub team names or is the Mail trying to be funny or merely patronising. (The pub teams I know either have names simple beyond belief, for example, Two by Two or Sisters in Crime, alternatively some chose obscure names, for instance The Last Dials. the latter hopefully suggesting a team of brainboxes with a strange nom de plume, the origin of which is known only to themselves. Three examples from the Mails offering. Robert De Nero directed which film. a The Good Shepherd b About a Boy c Frankenstein d Backdraft. Lake Baikal, the oldest and deepest lake in the world is situated where? a Africa b Siberia c China d Turkey. Patsi Kensits second husband is a member of which band? a Oasis b Simple Minds c Petshop Boys d Tears for Fears. The earliest form of quiz I personally remember was sitting the Eleven Plus. (Quiz-To test the knowledge of by posing questions.) I still remember two of the questions. George Washington was born, married and died in the house he built himself. Which one is incorrect? Yesterday, today was tomorrow. True or false? What exactly did right answers prove? I suppose they had some merit, though you had a one in three chance of getting them right anyway. Plus knowledge for its own sake seems pretty pointless. Alfred Lord Tennyson was a cut above all of us and he put it so well. 'Knowledge comes but wisdom lingers.' There again I bet he was useless in pub quizzes. But I digress plus it wouldn't do for this blog to appear in any way intellectual! In the non too distant past I was involved in setting quizzes to improve school moral. Teachers can be very competitive, sometimes to a questionable degree; they just love to win. I suppose that's why many become teachers, to be in charge and show how clever they are. Pub quiz teams have more than their fair share of teachers and it shows. Though they don't always win. Many pub quiz members 'swot up' all week prior to a quiz. How 'anoraky' is that! For the less serious the easiest solution is a simple true or false format. At least you've got a fifty fifty chance of getting it right! Try the following for size. I set it many years ago when my brain powers were at their height! 1 The 'Real McCoy' was a boxer in the 1890's and 1900's. 2 Turtles have no teeth. 3 Cat gut comes from cats. 4 If you were born on the 29th October, your star sign is Libra. 6 The Lily of the Valley is the National flower of Norway. 7 The Great Wall of China took 1700 years to build. 8 Aphrodite is the Roman goddess of love. 9 The first mechanical clock had no hands. 10 Mary Stuart became Queen of Scotland at six months. 11 The clock above the leading article in The Times always shows 5.30. 12 Charlotte was the youngest of the Bronte sisters. 13 The average lead pencil will draw a line 35 miles long. 14 Originally the yo-yo was a Filipino jungle weapon. 15 Teddy bears were named after Theodore Roosevelt. 16 Dogs sweat through their paws. 17 Queen Elizabeth the Second was born at 17 bruton Street, London. 18 The wren is Britain's smallest bird. 19 "I shall hear in heaven" were the last words of Mozart. 20 A number of goats is called a tribe. 21 Bloomers are named after an American lady, a Mrs Bloomer. 22 And the Bowler Hat is named after an Englishman, Mr Bowler. 23 Roger Rabbit's wife is called Jessica. 24 And Andy Capp's wife is called Mo. 25 A walking camel lifts both feet on one side at the same time. Finally I came across this quiz in an old book I bought in the Alnwick Railway Station bookshop. The quiz is at least eighty years old I suspect. Treat with care, they were just as clever as we are all those years ago. The only difference was, they didn't shout as loud. A Very Simple Quiz for Very Clever People. I remembe r too food mysteriously spirited away nightly from our awnings in a park in Southport. Very strange, except that ghosts and apparitions have no need of our pork pies and treacle tarts, whilst tramps forced to sleep rough on the seafront definitely rate such culinary delights. We have stayed in our tr ailer tent days inside the RAF Museum at Cosford. 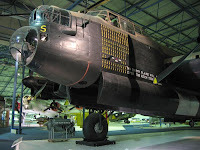 It is reputed that one aircraft, the Avro Lincoln RF398 is haunted. In the evenings when the public has gone home the place has an eerie mystique not easily dismissed. Whilst we cannot claim to have even fleetingly glimpsed a ghost, we did meet a volunteer who adamantly claimed an unearthly presence regularly misplaced his cleaning clothes as he worked on the aircraft. Similarly Hadri an’s Wall is awesome yet, on a dull day at least, foreboding. Built by the Romans between AD 122-30, it is a stone and turf fortification built to keep out the Pictish tribes. It takes no great imagination to picture Roman soldiers marching the wall tops, weapons at hand to deter the warring Pics. And when the wind howls and the snow falls, who can be blamed if they hear the sound of caligae (military sandals) tramping the wall or the shouts of those in command urging on wet, cold soldiers. A visit to Naseby is somewhat disappointing. The site of the most important battle in England, its importance in English history is unsurpassed. Here on June 14th 1645 Royal troops led by Prince Rupert fought Parliamentary troops under the command of Sir Thomas Fairfax. There has been little attempt to market, if that be the right word so important a place in our British heritage. Contrast the wonderful, informative modern displays at Culloden and Hadrian’s Wall. Staying in the area we visited the site of the battle, its presence almost grudgingly acknowledged by the local authority. A monument, open fields and that’s about it. Yet shut your eyes and the sound of battle can be heard by anyone with a feel for history. In the daytime just fields that could be any old fields. But at dusk an indefinable presence takes over and the sound of battle cries are never far away. 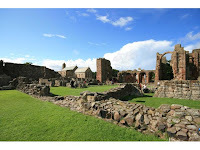 Some years ago we visited Lindisfarne, a favourite haunt if you’ll forgive the pun. It was a bright summer’s day, not a cloud in the sky or ghosts in the air. We had by then a new, all white English bull terrier by th e name of Sam. The churchyard contains several thought provoking graves and I was keen to see them. I wrote this article for Motorhome Monthly. 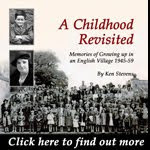 I think in view of this weeks 'ghostly happenings' it is worth revisiting! On another occasion a mirror propped on a shelf was found, again unharmed on the floor, in this case a more sinister mystery. In order for the mirror to fall on the floor it had to clear the ornaments in front of it. Yet the ornaments were still in place when the mirror was discovered, an unnerving phenomenon not easily explained. Nevertheless eventually my daughter moved out, my wife and I moved in and we had eleven happy years in the place. We had two bull terriers in succession, Buster and Sam and we even moved in an elderly aunt, Ida. Ida lived with us for eight happy years until she died peacefully in her bed, aged ninety four. Time moved on and I have become more and more rickety so when my oldest daughter Sarah and her family moved to run a business in the north west my wife and I decided to buy their bungalow; it seemed a logical thing to do, creaking bones are better suited to bungalows than three story houses. A very pleasant bungalow, our new home, extended but originally built in the nineteen thirties was owned at one stage by an elderly widow. I did wonder if the old lady died at home but it's probably of no concern. Nineteen thirties houses don't have ghosts, or do they. We've lived here since the last week in August. And on a couple of occasions I swear I felt something large jump on the bed. I even felt the mattress momentarily dip. Surely imagination except that my daughter rang rather agitated. She used to also have a bull terrier by the name of Spike. Spike is buried in the garden and she has woken in a panic on more than one occasion, having dreamt I have have dug up poor old Spike. Not true, at least not yet. Anyway, you shouldn't let dogs sleep on beds though we all do it! I was tidying, the garden in the week. Very secluded, no one can see in and you can't see out. It was a sombre, gloomy dark day, not exactly one to enlighten the spirits. Suddenly I became aware of a voice. "Is anyone there." A typical case of heard and not seen rather than the reverse. Startled and not a little apprehensive I surveyed the scene; nothing. "Is anyone there" again broke the silence; nothing. Then came the clincher, so to speak. "Is anyone there, it's Ida." The final proof of the afterlife, for how could anyone now doubt that the spirit lives on. For I heard it with my own ears. "Its me, Ken" I replied with bated breath. And the apparition's head appeared over the eight foot fence, for apparently apparitions can climb on whatevers handy when they so desire. "Its me, Ida, your neighbour. Can you cut back your brambles. They're coming through the fence." Today's Times tells the story of the Bougon family in France who have reacted bitterly to the French Canadian fictional TV series 'Les Bougon', concerning a fictional family of scroungers, fraudsters and alcoholics. The problem is, bougon in French translates as 'grumpy' thus the Bougon families concern. Labels: Les Bougon, TGA, Times. 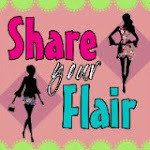 I am new to this blogging lark and still learning. I remember reading that one of the blogging crimes is committing 'cyber pollution' I think it was called; blogging for blogging's sake. The suggestion being, only blog when you have something to say. Daily newspapers blog ad nauseum, the result often self indulgent, banal and boring. Perhaps it is inevitable when you blog for money and have to do so to a daily deadline; I have no such pressure. Yet I fret if I cannot regularly blog, it has become part of my life at least for the time being and I reckon twice a week 'suits you, sir' as the gentleman in the advert implies. 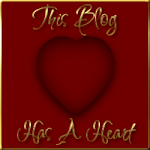 I am not even sure why I blog. Nice thought if someone were to read my work when I am long since gone. Nice also to leave something in perpetuity, so to speak. Plus my children and my children's children might read my limited efforts and learn something of my life, though not wishing to sound self importance or arrogant. Each and every point relevant in a small way. All week I've wondered what to write. The weathers been mixed, life acceptable if somewhat mundane. A week like a thousand others except that Monday October 13th was like no other; yesterday our world stood still, the day my wife and I became virtually insolvent. We are in the middle of buying our present, much cherished, hopefully last residence. (The next move will be a pine box job, feet first.) Because of complications too boring and complex to think about, virtually every penny we have has been converted to a cheque to be exchanged on Thursday for one 'des res'. The premium bonds, the Isas, the shares, all gone. Yesterday the turn of the bank accounts which is why we stood in the queue at a branch of the Nat West. To be truthful my wife is glad the money had gone. we both have had visions of being financially wiped out prior to the sale. Yesterday Britain subsidised our banks to the tune of thirty seven billion pounds. The FT index went up by over eight hundred points. Roll on Thursday! We come into the world with nothing and if our previous house doesn't sell we may leave with nothing. I'm just going through my pockets for any small change. If I find enough I'm going for a pint and a plate of chips later today. By the way, all donations gratefully received! Friend: one with whom one is allied in a struggle or cause; one who supports, sympathises with, or patronises a group, cause or movement; any associate or acquaintance. I made a new friend in the week, in our local Lidl as a matter of fact, a shop of many cultures, languages and ethnic groups. We, my wife and I were just going through the checkout when a young boy, aged around nine or ten came through the exit doors, complete with bicycle; the bike was rough, the boy similar. He deposited the bike near the tills, looked in my direction and approached. I assumed I was to be 'chatted up' for a 'donation' towards his finances but I was wrong. 'You look after my bike' he pronounced with authority. Who was I to refuse such a request, nay, order. He vanished through the tills (the wrong way of course and was gone to do his shopping.) I hoped soap was on his list of requisites, for it was sorely needed. Every few seconds he reappeared in the isles and looked in my direction to be sure I was fulfilling my duties as 'guardian of the bike'. He was certainly not going to have his ramshackle bike 'pinched'. I did wonder if that is how he got the bike in the first place! Would that have made me an accessory? Eventually he returned (It's a good job pensioners do not 'do' pressing engagements.) He had half a dozen items including a large bottle of Coca Cola (but no soap). The checkout lady rang in the items, he rummaged through his pockets. The money he produced was insufficient and he discarded one item. Money added up again and he was still thirty two pence short. I did consider giving him the difference (a lot of money, thirty two pence to a pensioner in these hard times) but was beaten to it by the next lady in the queue who 'donated' the difference by putting it on her bill. The boy then requested a bag (there is a charge for them but one was found free of charge) and he returned by my side to reclaim his prized bike. He was evidently Polish and I'm sure he was appreciative of my services; at least I hope so. I returned to my vehicle; my wife had long since loaded our shopping and we made our way home. Around three hundred yards away we passed a young boy carefully parking his bike outside another smaller shop. The last I saw of him he was vanishing inside; I could have sworn he was down to his last penny not ten minutes earlier. I have a good friend who is a fanatical 'twitcher'. He has seen over four hundred different species of birds in Britain which I suspect would put him in the top hundred or two in the country. (Where most middle aged men ogle pictures of semi clad young ladies my friend peruses pictures of Peregrine Falcons and Green Woodpeckers). Last week a bird turned up in Lands End. Even the twitching world seem unclear as to whether it was an Alder Flycatcher or a Willow flycatcher. No matter it was a first for Europe as they say, not to be missed. My friend and a friend (twitchers seemingly always travel in pairs and mate for life) made their way to Lands End after work on Tuesday. Now Lands End is three hundred and sixty five miles from Derby. A fact always remembered as its the same as the days in a year. The bird was duly sighted, presumably ticked and the intrepid pair returned the same day, mission accomplished. Dedication, devotion, mind boggling surely certifiable behaviour, take your pick. But a shared addiction nevertheless. There was naturally concern from some that accompanying her friend to hospital would seriously affect Alison in her somewhat fragile state of mind. Alison insisted on going, her simple answer, 'She's my friend, I've got to go' says it all. Well done Alison. Friend: a favoured companion; a person whom one knows, likes and trusts. That anyone by choice would witness the sad demise of a fellow human being defies any understanding. That some enjoyed the drama, to the extent of giving abuse and shouting encouragement to jump defies comprehension. Plus the amazing fact that some allowed children to witness the unfolding spectacle. Add the fact that some recorded events on mobile phones (in some cases later posted on internet sites) and you have a 'happening' that is mind bendingly beyond the understanding of normal people. Anyday now the first Christmas lights will appear on Harvey Road, part of Derby's ring road. It is as if there's a competition to be first. There is certainly a competition in my family to be 'the first spotter' so to speak! I am reminded of all this on Tuesday, the last day in September, the reason being, I had a haircut and beard trim. And yes, there is a connection as I will explain. Being short and bearded, the latter for many years, the former, forever, it is not unusual for people to look in my direction when a 'Santa' is required. (see blog dated 22 September) It is not true that in summer I am a model in a garden gnome factory. I am reasonably happy to oblige but parents insist on the real thing, so to speak, no false beards allowed; herein lies the problem. I used to regularly visit playgroups in my role as Community Service organiser at Noel Baker Comprehensive School. In the run up to Christmas I was viewed with awe by many three to four year olds. And this is where it became a little naughty. On occasion it would be suggested I was Santa's brother, a deception seldom queried by small children still innocent of the wicked adult world that lay ahead. The best behaved received the solomn promise that I would inform my brother as to their Christmas wish list. The worst behaved were informed that they needed to reform their wicked ways before 'Brother Santa' could even contemplate a visit. I know, I know, dreadfully non PC behaviour not acceptable today. (Is Father Christmas politically incorrect nowadays?) All this immature behaviour, but lets face it, I'd probably pretend to be Usama Bin Laden if I was wandering in and out of playgroups in the present climate of fear and uncertainty. Some of us never grow up! Strangely enough Bin Laden is left handed like myself and we both use a stick on occasion. Mind you, he is around six feet five to my five feet five. Do little children know all this! I digress. The haircut and trim was hopefully timed to ensure I am reasonably tidy for the next few weeks but suitably long bearded for Christmas week. Discussion resulted in the use of a number three razor cut. The result is more suave (only kidding) than Santa. We have eleven weeks to go. Is our timing correct. Watch this space!